Canadian Prime Minister Justin Trudeau during an event at the Toronto Region Board of Trade in Toronto on Feb. 7, 2019. Prime Minister Justin Trudeau confronted allegations of political interference by his office on Thursday, saying he did not “direct” Jody Wilson-Raybould when she was justice minister and attorney-general to abandon the criminal prosecution of a Montreal corporate giant. But he repeatedly refused to say whether his office tried to influence her to do so. The Globe and Mail reported on Thursday that Ms. Wilson-Raybould had resisted pressure from the Prime Minister’s Office to issue a directive to the Public Prosecution Service of Canada to shelve court proceedings against SNC-Lavalin Group Inc. in favour of a negotiated settlement without trial. Later in the House of Commons, opposition parties called for “full disclosure” of what happened. The Quebec engineering and construction company has sought to avoid a criminal trial on fraud and corruption charges that stem from an RCMP investigation into its business dealings in Libya. Prosecutors alleged SNC paid millions of dollars in bribes to public officials in Libya between 2001 and 2011 to secure government contracts. The engineering company says executives who were responsible for the wrongdoing have left the company, and it has reformed ethics and compliance rules. On Thursday at an announcement on transit funding in Vaughan, Ont., Mr. Trudeau said senior officials in the PMO did not direct Ms. Wilson-Raybould to intervene in the SNC-Lavalin case, but he would not say whether they tried to induce her to abandon a prosecution and trial of the Montreal-based corporation. The Globe and Mail never reported that officials in Mr. Trudeau’s office had directed Ms. Wilson-Raybould to take action – only that she was pressed to do so and declined. Opposition MPs took issue with Mr. Trudeau’s responses during Question Period. 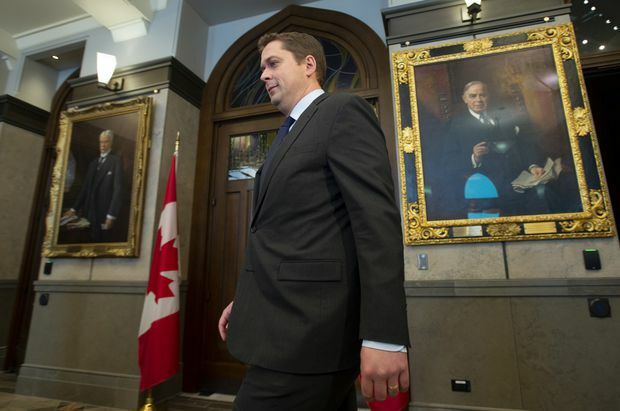 Leader of the Opposition Andrew Scheer makes his way to speak with the media in the Foyer of the House of Commons in Ottawa, on Feb. 7, 2019. In the House of Commons on Thursday, Ms. Wilson-Raybould did not respond when Mr. Scheer asked her to confirm whether the PMO had spoken to her about the SNC-Lavalin legal case. Justice Minister David Lametti was forced to field question after question, and repeated the Prime Minister’s early remarks. At one point, though, he said neither he nor Ms. Wilson-Raybould had received political pressure or a directive to intervene in the SNC-Lavalin matter. “As the Prime Minister said earlier today, neither the Prime Minister nor his office put my predecessor or myself under pressure nor gave any directives,” he said. Ms. Wilson-Raybould was asked on the way out of the House of Commons whether Mr. Lametti was correct when he claimed no one had put pressure on her. “I have no comment,” she told The Globe. Peter Russell, a professor emeritus of political science at the University of Toronto, praised Ms. Wilson-Raybould for standing up for the independence of the federal public prosecutors service. “I think Minister Wilson-Raybould is to be congratulated on understanding how important it is to retain the independence of the prosecutor’s office and not relent to any kind of pressure, including that from the political side of her own government,” Prof. Russell said. “I think she did well and Canada is indebted to her. … I can’t help but express disappointment that the Prime Minister’s Office does not seem to have understood, as it should, that this part of the minister’s job – being responsible for prosecutions – is not subject to cabinet direction,” he said. Ms. Wilson-Raybould trusted the judgment of the public prosecutor and did not believe it was proper for the attorney-general to intervene, especially if there could be any suggestion of political interference, sources say. The sources were granted anonymity to speak directly about what went on behind-the-scenes in the matter. Kathleen Roussel, the director of the public prosecution service, told SNC on Oct. 10 that it would not be asked to negotiate a remediation agreement. Nine days later, SNC filed for a judicial review of that decision. In December, Mr. Butts spoke to Ms. Wilson-Raybould about the SNC-Lavalin remediation case, according to Mr. Trudeau’s deputy communications director, Cameron Ahmad. He said the then-justice minister raised the matter with Mr. Butts and he told her to talk to Privy Council Clerk Michael Wernick, the top federal civil servant. SNC chief executive Neil Bruce told The Globe on Thursday he is worried about the company’s immediate future because of the legal uncertainty hanging over the business. “I think [the legal uncertainty] clearly, clearly, affects the short-term future of the company,” he said in an interview on Thursday in London, where the company has just opened a new European headquarters. “I am worried about the damage that these [legal] things continually do to the innocent,” he added referring to employees and shareholders. Although SNC very much wants to negotiate a settlement to resolve charges of attempted bribery and fraud, Mr. Bruce said he was unaware of any political pressure to get a deferred prosecution agreement. He did not comment on how Mr. Lametti, a Montreal MP, would handle the file. The Trudeau government in 2018 amended the Criminal Code to allow remediation or deferred-prosecution agreements that let prosecutors suspend criminal charges against Canadian companies found to have committed wrongdoing.